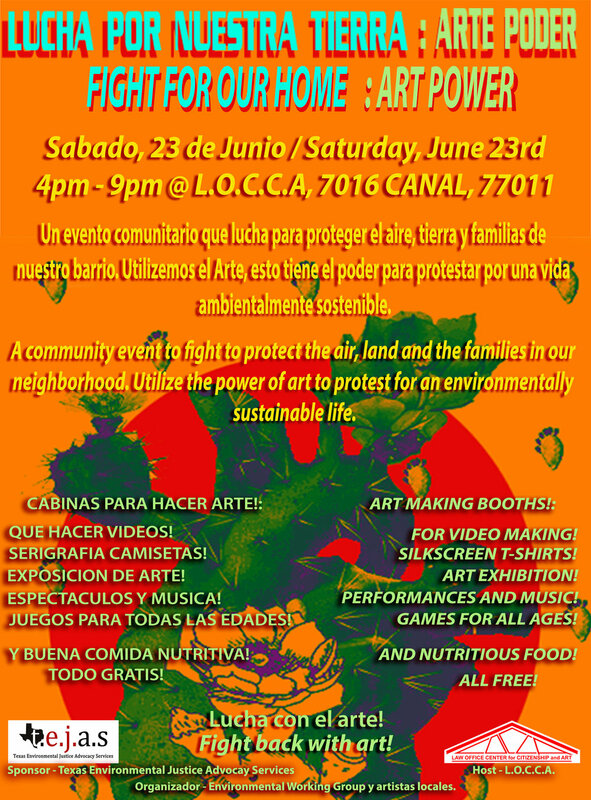 LUCHAS POR NUESTRA TIERRA/FIGH FOR OUR HOMES : JUNE 23RD — L.O.C.C.A. This artist initiative will provide art stations at LOCCA that can use the power of art making to send the message to all our neighbors and businesses in the East End of Houston to protect the quality of our air, land, neighborhood and health of our families. Featured will be sustainable art making practices, nutritious food, video making for PSAs, performances, music and an art exhibition of work that addresses the environmental state of the East End and Manchester neighborhoods. In addition to collaborating with us, T.E.J.A.S. will act as our fiscal sponsor. Any contributions can be made to the T.E.J.A.S. donate button on their website or a check can be mailed to T.E.J.A.S., 6733 Harrisburg Blvd, Houston, Texas 77011. Please write/place a note on any donation that it is directed to the “LUCHA PRO NUESTRA TIERRA/FIGHT FOR OUR HOMES!” event. The event is FREE and open to all ages. Below are details and the FB link. Hope to see you there!